Everyone nurses a secret dream to live in a thatched house, but for most people, the reality is daunting. Arming yourself with knowledge about thatched roofs might help you to take the plunge, so here are eight things you should know. Include a thorough electrical check in your survey. Dodgy wiring combined with thatching is a recipe for disaster. If the check shows anything up, ask the vendors to fix it immediately and get a check done every five years from then on. Thatched house insurance needn’t be as high as you imagine. Several insurers specialise in thatched properties – NFU Mutual and John Lewis to name but two – and they offer realistic premiums based on fact rather than fear. A dirty-looking roof might be just dirty, rather than decrepit. Get a professional thatcher to inspect it and if it needs more than a quick freshening-up, you can ask the vendors to drop the price. Get quotes from at least three thatchers before getting any work done. It’s a good idea to ask the owners of nearby thatched houses for their recommendations. Thatching takes a long time to learn, so choose someone with at least ten years’ experience. Remember, the title of “Master Thatcher” means self-employed, it doesn’t indicate experience or skill. More than three-quarters of the thatched properties in England and Wales are listed by English Heritage. If yours is listed, or in a conservation area, you’ll need to follow local guidelines when re-thatching. Many local authorities have historic building schemes to help to repair and maintain listed properties. 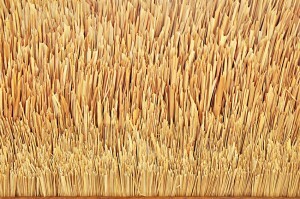 You may be able to get some financial help towards re-thatching. Have a professional check your chimney and flue to make sure it’s in good condition. Make sure you use sensible firelighters, have your chimney swept once a year minimum and invest in fire alarms.